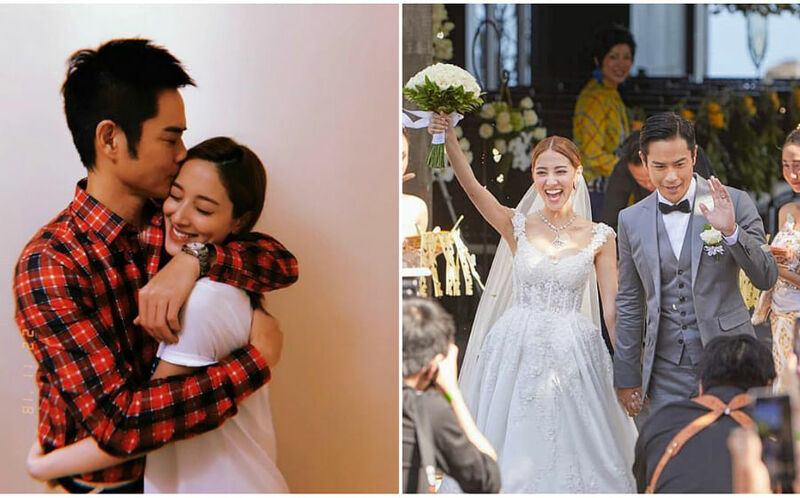 A local celebrity's marriage has bitten the dust but these famous Singapore couples will restore your faith in love. While we are often devastated and shaken whenever relationships bite the dust, we shouldn’t lose all faith in love. Here are some couples who have bucked the trend and are still going strong. The down-to-earth couple have been together for over two decades, and still look blissfully happy. Be that as it may, it was not love-at-first-sight when the pair first met as colleagues at Mediacorp (formerly known as Singapore Broadcasting Corporation). Back then, Ge Ping, who is three years younger, was still a rookie actor and didn’t think the Ah Jie would give him a second look. In fact, in interviews, Hui Fang admitted she thought he was an “Ah Beng” (or hooligan). Thankfully, they grew to like, and subsequently love each other, after a chalet getaway with a few mutual friends saw them getting to know each other better. They are now proud parents to two budding stars, Tay Ying, 22, and Calvert, 18. The pair say they try to keep the spark alive by being loving and continuing to see the good in each other. They make sure they set aside couple time and enjoy a glass of wine together at night after the children go to bed. It’s been said that “hunkle” Ge Ping tries to kiss her goodnight every night, while she bakes bread for him every morning. Everybody say: Aww. This old-timey couple have gone through both good times and bad (think Slim 10 saga), and are still going strong. They have a son Xavier, who was born in 2002. Fun fact: They never took any official wedding photos because Liping had a phobia of wedding dresses, having worn too many of them for work. It was only in 2015, 17 years later, that they had wedding photos taken for the first time — for a drama. Incidentally, they played a married couple, complete with ‘wedding photos” in their first series together, Golden Shenton Way (1990), but this was before they started dating. The pair are still really sweet, even after decades of married life. According to Liping, Rayson has also been incredibly supportive despite her weight struggles. Definitely a keeper! Their speedy marriage (they got hitched just three months after first meeting) reportedly caused quite a stir back then, but the feisty duo have since silenced all critics. They have two kids, son Yi Xi, 27, and daughter Yi Xin, 18. Of course, the two have had their share of struggles and quarrels — there was once they got into such a big argument on set, the crew members quietly left! — but they always manage to work things out. They also make sure they spend time together as a family, such as travelling at least once a year. According to their children, Xiang Yun and Edmund like to joke around a lot, and are generally happy people. Goes to show, a couple that laughs together, stays together! This adorable baby-faced couple met in 2002 while filming Springs of Life, and were best buddies for years until they got together in 2007. Priscelia frequently gushes about her actor-turned-businessman husband on social media and in interviews, expressing her gratitude on his love and patience towards her.”Words cannot describe how thankful I am to God for blessing me with you — a love and marriage so true and strong. A husband who never despise me when I was going thru a sudden massive traumatic health ordeal for the past two years…But you still tell me I am beautiful in your eyes.” she wrote on Instagram. The pair once said in an interview that the secret to a lasting marriage is love, communication, affection, respect and a good sense of humour. How sweet! This good-looking couple is a match made in heaven. The former actress-turned-presenter and her actor-turned-banker husband first met in 1994 on the set of Showbuzz, before getting married in 2004 after a nine-year courtship. Proud parents of three children, Jake, 12, Christy, 10 and Jayme, 7, they are still lovingly affectionate. James, who doesn’t have Instagram, features heavily on Diana’s account — in fact, she joked in an interview that half the people who follow her are actually following him. While she admits that they are both pretty busy and the kids are currently their priority, they make an effort to set aside couple time, such as taking a holiday, just the two of them, or going for a meal. “We must accept that our notion of romance has evolved. There should be an acceptance that things have changed from the time we were dating. Now we connect on a different level. When play together with the kids, it’s deeply satisfying because you’ve built this family together,” she said in a The Straits Times interview. Wise words.